The hydraulic cylinder manufacturer AHP Merkle, which is headquartered in Gottenheim in southern Baden-Württemberg, uses KASTO’s automatic sawing and storage technology for storing and cutting its raw materials. 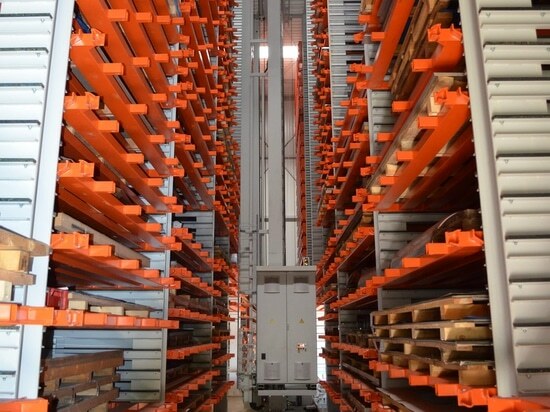 The space-saving UNITOWER tower storage system, the KASTOvariospeed CNC-controlled circular sawing machine and the KASTOsort robot-assisted sorting system all help the hydraulics expert meet its customers’ requirements: short delivery times combined with a wide-ranging, high-quality product portfolio. Whether in cars or motorcycles, machine tools or presses and rolling mills for the manufacture of die cast parts: In countless applications, hydraulic cylinders make sure that the moving parts move in exactly the right way. The hydraulically driven linear motors offer a number of advantages: They are versatile enough to be used in many different applications, can be continuously and precisely adjusted, and offer a long service life combined with low maintenance. What is more, thanks to the countless designs and different materials, design engineers can choose exactly the right cylinder to meet the precise requirements of the application in question. And hydraulic cylinders are precisely the area where AHP Merkle GmbH excels. For over 40 years, this family-run company, which is based in Gottenheim in southern Baden-Württemberg, has been manufacturing top-quality solutions for customers from a wide range of industrial sectors, such as toolmaking, mould production, mechanical engineering, aluminium die casting, as well as for the automotive industry. The company’s portfolio comprises standard, block and stamping cylinders, push and core pull units, clamping elements, rotary drives and many other items. AHP Merkle employs approximately 150 personnel at its headquarters. It also has Chinese sites in Hong Kong and Shenzhen and some 20 overseas distributors in Europe, America and Asia. Like many other successful mid-sized businesses, AHP started out from small beginnings. In 1973, the company’s founder, Gerhard Merkle, started to design and produce hydraulic cylinders in his apartment in Gundelfingen near Freiburg. His office was housed in his living room and the garage was used for manufacturing. Business was so successful that Merkle was able to take on his first employee in 1975. The company continued to grow and changed premises several times over the following years: first of all to a larger apartment – with a larger garage – and then finally, in 1981, to an industrial building in the nearby town of March-Hugstetten. Three decades later, even this site was no longer large enough to satisfy the company’s growing requirements. In 2010, AHP Merkle moved into a completely newly built head office in the neighbouring town of Gottenheim. Here, everything is designed to ensure a lean, efficient production process. All the manufacturing operations are performed in-house and are linked by short transport routes. “In addition to the quality and selection we offer, our customers particularly appreciate our short delivery times,” explains Paul Gutmann, Plant Manager at AHP Merkle. “With such a broad product portfolio, versatile, high-performance production and logistics are vital to us.” The company keeps some types of cylinder permanently in stock, finished and ready for shipping. If required, these can be with customers anywhere in the world in just a few days. AHP manufactures all its other solutions to order based on a modular construction system. This specialist manufacturer purchases the raw materials for its hydraulic cylinders as bar stock, usually in the form of 3-metre-long rods. A variety of steels and aluminium constitute the most frequently used materials. “To ensure that we can react quickly to incoming orders, it is an advantage for us to keep as many sizes and materials as possible in stock,” explains Gutmann. 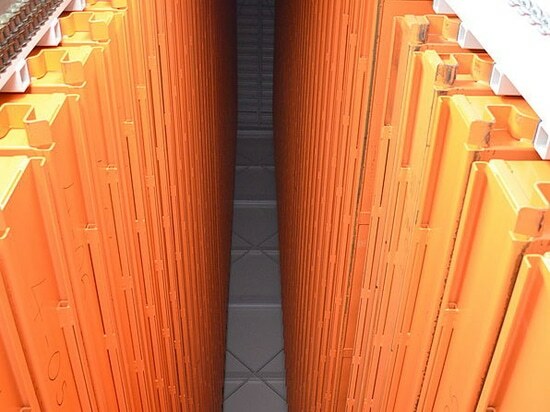 “This is because the procurement time through to the delivery of certain materials can be as much as half a year.” As a result, when the new company headquarters was built, it was designed to incorporate a UNITOWER tower storage system from the sawing and storage technology specialist, KASTO. With 94 storage locations and a height of 18 metres, it represents a compact, space-saving solution for the storage of bar stock. 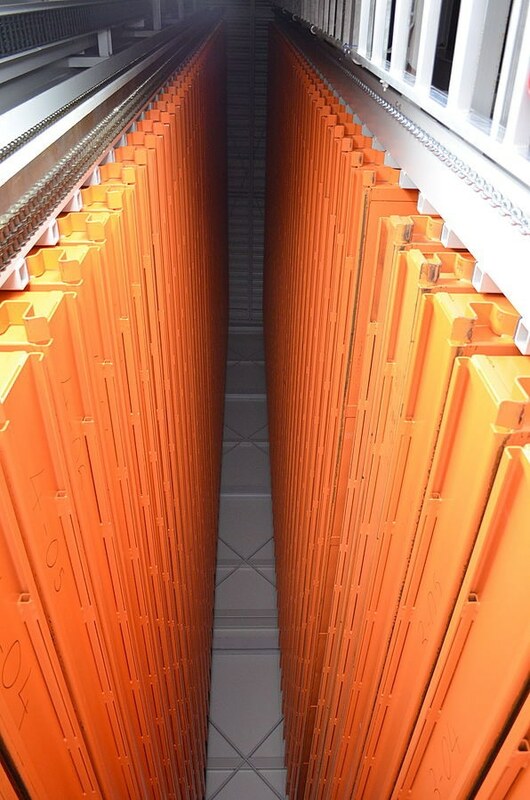 The loads are supported by cassettes, each of which has a capacity of three tonnes. These are filled at an input station at the front of the tower either manually or using a gantry crane. “The UNITOWER system not only makes optimum use of the available space, it is also extremely efficient,” explains Holger Dehmelt from the KASTO sales department. An operating gantry crane with loading traverse handles the load supports. “Compared to paternoster systems, this has the advantage that it is not necessary to move the entire stock, only the relevant cassette. This ensures fast access times and saves energy.” The responsible personnel at AHP Merkle were equally enthusiastic about the new storage system. Plant Manager Gutmann is full of praise: “The UNITOWER system has totally convinced us with the performance it offers every working day. That is why, when we were faced with the need to expand our capacity last year, we decided to implement a second tower of the same construction.” Since then, AHP has had twice the number of storage locations and is consequently able to keep an even larger range of materials in stock. The cassettes are transported along two roller tracks into the production facility, or, more precisely, the sawmill. Here, too, KASTO technology has been in use since 2014: in the form of a KASTOvariospeed C 15 fully-automatic, CNC-controlled circular saw. “Just as in the stores, we also reached the limit of our capacity in the sawmill last year,” remembers Gutmann. 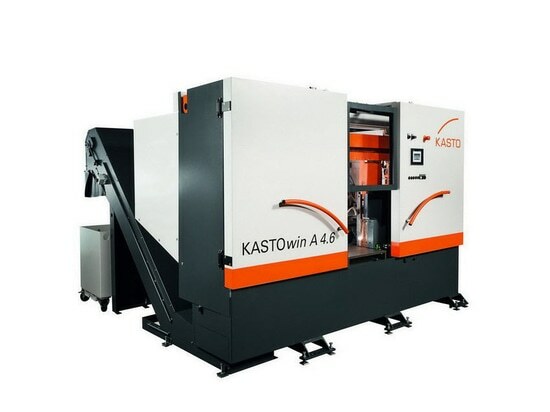 “What is more, one of our saws was beginning to show its age and had to be replaced – that is when we decided to work together with KASTO once again.” Thanks to the installed storage technology and visits to one another’s stands at a number of trade fairs, the companies were already in close contact. 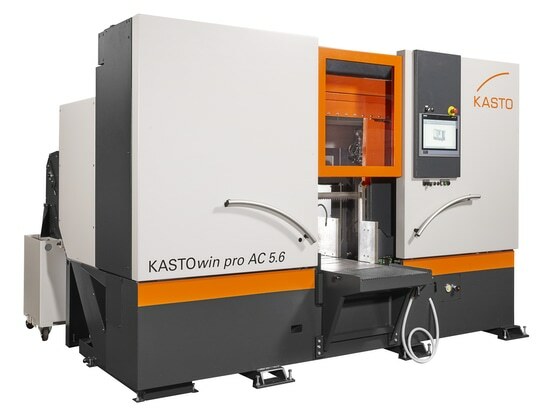 What is more, with the KASTOvariospeed, the technology leader from Achern-Gamshurst in Baden-Württemberg had a solution in its portfolio that perfectly fulfilled the hydraulics specialist’s needs. The saw is suitable for cutting solid materials, sections and tubing of all qualities and can even handle difficult-to-machine materials. The cutting range is 152 millimetres for round materials, 155 x 120 millimetres for flat materials and 135 x 135 millimetres for square materials. The robust design and high-performance, frequency-controlled drive ensure short cutting times, while the ultra-thin carbide saw blades guarantee outstanding precision and low material wastage. The KASTOvariospeed can be operated simply and intuitively via a graphical user interface. It is fed from a universal magazine that is able to hold up to ten of the three metre-long rods. “As a result, we can also leave the saw to run unattended for long periods, for example after the end of the late shift,” explains Sebastian Schweizer, production foreman in the sawmill. Because once the machine is loaded with input stock, everything else runs automatically. The material and order data are stored in the EasyControl sawing machine controller which is integrated with AHP’s ERP system. A hydraulic pressing roller with position measurement ensures automatic material height detection, while an NC feed unit with pulling rod permits cut lengths of between seven and 2,000 millimetres in a single operation. To avoid any AHP employees having to remove the cut parts from the saw by hand, KASTO combined the system with a KASTOsort automatic sorting system equipped with two robots specially mounted to minimise space requirements. These not only remove the cut parts and stack them on pallets or in containers, but are also able to deburr them: “This makes the job easier for us and saves us a lot of time. Because deburring all the parts manually used to be extremely time-consuming, especially when manufacturing large runs,” recalls Gutmann. After the sawing operation, the first of the two robots picks up the cut part from the machine using one of a total of eleven vacuum grippers, which can be exchanged fully automatically, and inserts it into a clamping device. At this point, the second robot takes over. This has a pneumatically pretensioned milling head which uniformly removes all the burr. To further optimise the process, the system is equipped with four clamping devices which can be used to fix round and square material securely in place. Even while the first workpiece is still being machined, the robot is able to remove a second workpiece from the saw and clamp it. This reduces the cycle times. The cut parts are then placed in one of up to four containers. Here again, KASTO’s technology has been able to demonstrate its versatility. “The robot can either stack parts in separate dedicated containers or combine them as required for each specific order,” explains Schweizer. A lift truck then transports the cut parts to the next production station. “There is also already an interface to a driverless transport system,” adds Gutmann. “That could be one of our next investments.” Both are absolutely delighted with the cooperation with KASTO: “The planning, assembly and commissioning all ran completely smoothly,” recalls Gutmann. And what is more, AHP can count on the support it needs: Thanks to the remote maintenance facility, KASTO’s experts in Achern are able to access and optimise the system. If there are any questions, an appropriate expert is only a phone call away – and if required can rapidly travel to the site. “You couldn’t wish for better service,” says the enthusiastic Schweizer. Precise high-performance band saw reduces cutting times by up to 50 percent. 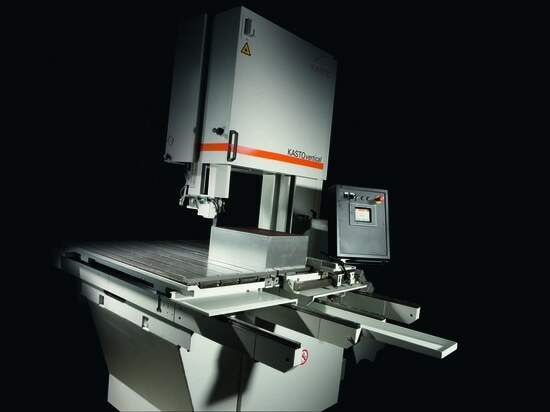 The specialist for longitudinal cutting. Effective organisation of made-to-order production.